The toe of Harvard coach Wesley E. Fesler, who has been one of Ohio State's All-American stars, was caught by the flash in mid-kick. In his laboratory notebook, Edgerton wrote, "Herb Grier and I went up to Harvard and took some spark photos of a football being kicked to shot distortion of the ball." 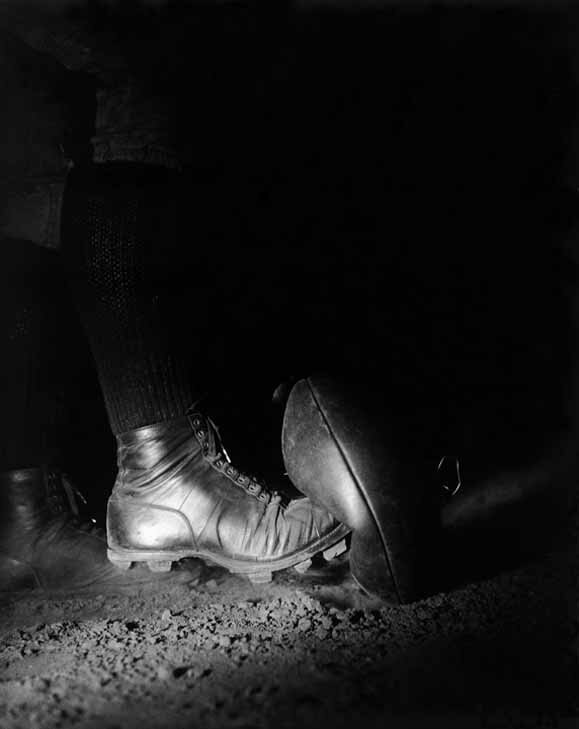 The boot penetrates more than half the diameter of the normally inflated ball and the dirt that was lodged in the top seam of the football hovers above its original location just as the ball was kicked. The football actually took its own picture by pushing two wires together to complete a circuit and trigger the flash. But the photo had to be taken in near or total darkness so the image would not be overexposed. Some of the other negatives from the shoot show that sometimes Fesler missed the ball completely or that the flash went off too late. Athletes of all types were some of Edgerton's most popular subjects. Gus Kayafas, Edgerton's student and lifelong colleague recalled, "Edgerton believed in Pascal's statement that 'chance favors the prepared mind.' When Doc and I went to Ohio State for an exhibit and lecture I had arranged, the Director of the art museum remarked that it was the first time representatives of the athletic department showed up at an art event- Doc and I had made a gift of this print to the Athletic Department. Edgerton knew how to enlist people of all ages and walks of life into his projects."